This weekend my two little sisters came to visit. We decided to have a craft night. These are some pictures of Heather and Ashley that night. My sisters are hilarious. There was obviously alot of drinking involved. 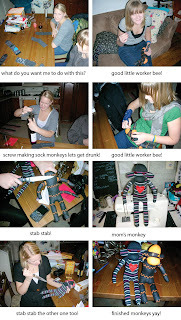 Ashley made a really awesome sock monkey and we made an awesome one for my mom. She loved it! CLICK THE PICTURE TO READ IT BETTER! That looked pretty ridiculously fun. Your mom's sock monkey is awesome!! It's like a taxi cab monkey! Yay for sisters making monkeys together.